“You’d be surprised how many people unknowingly damage their computers,” says Derek Meister, a technician for Best Buy. Have you ever caused a problem for your computer because you simply didn’t know better? No-no #1: Using a laptop on your lap. 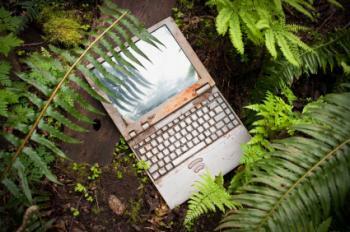 Though it’s called a laptop, ex­­perts say it’s meant to stay on a flat, firm surface. That way, air flow around the machine and into its air-intake vents will keep it from overheating, a major cause of component failure. No-no #2: Walking around with a laptop while the hard drive is active. When a laptop’s hard drive is active, its actuator arm skitters across the surface saving or reading data, which means movement could knock the arm into the computer’s fragile magnetic memory material. “A lot of people close the lid on their laptop and throw it in their case without making sure the hard drive has shut down completely,” said Chris Kramer, director of technical support for Micro Center. Tip: Put it in “sleep” or “hibernate” mode before closing the lid, and give it a second or two to obey the command. Listen for the spinning noise to stop before moving the laptop. No-no #3: Leaving a laptop plugged in nonstop. You’ll diminish the battery’s life. Unplugging two or three times per week is enough to keep it fit. No-no #4: Completely draining a laptop’s battery, or leaving it un­­charged for a long time. It can cause a degradation of its chemicals, says M. Stanley Whittingham, a chemistry professor at State University of New York at Bing­hamton. No-no #5: Tugging at the power cord. Those little pinlike contact points within the computer get stressed out when users tug at the power cord. No-no #6: Setting it up near Fido. Dust or animal fur can slow down or freeze up a computer. For example, one person found a half-inch of dust inside his computer when he took the case off. It had been set up near a paper shredder. Best Buy’s Meister is among the experts who recommend an annual desktop and laptop cleaning. — Adapted from “Make Sure the Problem Is Not in Your Chair,” Kate Murphy, The New York Times.